Whatever’s worth watching once is worth watching twice. 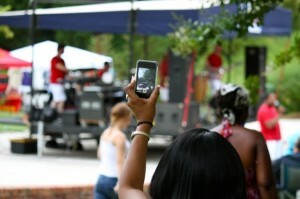 This fan records a part of Thursday night’s Plaza Jam to share later on. ROCKINGHAM — You can take the girl out of New York, but you can’t take the New York out of the girl. 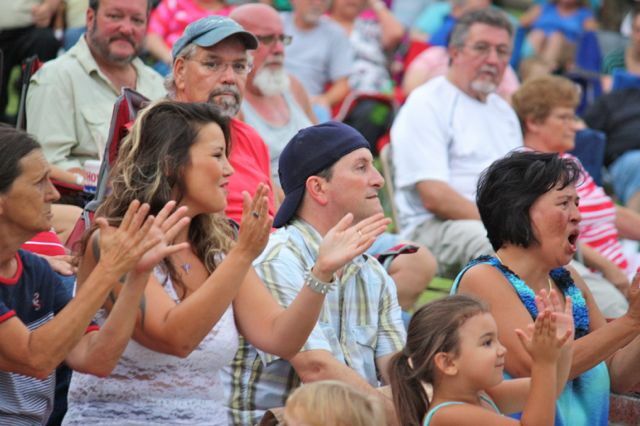 Fans applaud The Sand Band, from Pinehurst, Thursday night at the third of six Plaza Jam sessions this summer. The soul-shaking was contagious Thursday, as others of all ages followed suit. Even young, bashful Noah Goodman tried it. Noah, 3, was wary of a photographer’s lens training on his movement but when the camera wasn’t looking, Noah was moving with his mom, Danielle Goodman. The brick wall sufficed as a temporary resting area until Noah was ready to get up and dance some more — whether mom was ready or not. A few hours before the scheduled 6:30 p.m. start, the sky over Rockingham continued to appear darker and threatening, a foreboding of storms to come from the remnants of Hurricane Arthur. Arthur was a no-show, however, this far inland and not a drop from from the clouds during the two-hour performance. Each Plaza Jam, a free six-performance summer concert series coordinated by the city of Rockingham, is from 6:30 p.m. to 8:30 p.m. and is free to the public. The remaining schedule includes Too Much Sylvia on Aug. 7, Fantastic Shakers on Sept. 4 and the Craig Woolard Band on Oct. 2. 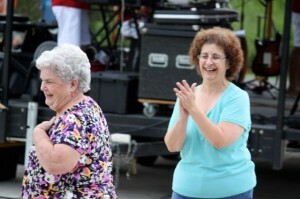 Angela DePietro, right, and Patricia Teal Adams shag — also called the New York Hustle, DePietro says — during Plaza Jam.